Leon Smith Jr., 48, wanted to be a firefighter since he was nine years old. Even as a kid he would hang out at the local station. In February of ‘82, his dream came true and he was appointed to the FDNY. He remained with Ladder 118 for his entire career. The 1980s were not necessarily the easiest time to be an African-American New York City firefighter. The FDNY is a very tight community of fathers and sons and brothers, and it took trailblazers like Smith and Cherry to break open some of the ingrained traditions. As they did, they became indispensable members of that brotherhood. Smith got the nickname of “Express” because, as the chauffeur, he was determined to get Ladder 118 there first. This skilled mechanic sometimes called his truck his “girlfriend.” At 6’4” tall and 210 pounds, Smith was sometimes also called “Physical Lee.” This father of four daughters was never found. 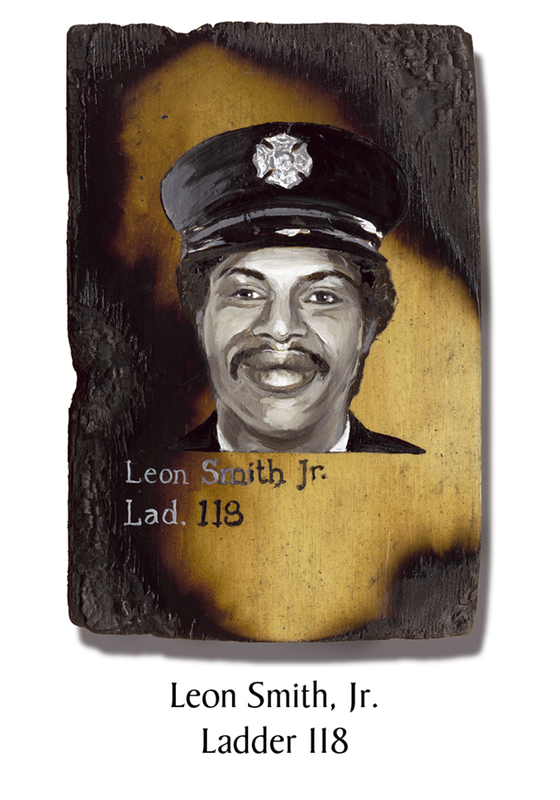 Leon Smith Jr. has a tombstone, but to this day his family has not yet been given anything to bury in his empty grave. This entry was posted in Better Angels Stories and tagged 343, 9/11, better angels, Dawn Siebel, FDNY, firefighter, firefighters, firefighters of 9/11, Ladder Co. 118, Leon Smith Jr, LODD, Manhattan, memorial, NFFF, paintings, portraits, World Trade Center, WTC. Bookmark the permalink. One Response to Firefighter Leon Smith, Jr.
My father will forever be my hero. His memory will love on forever.